The world premiere of an extraordinary work written during the peak of the AIDS epidemic by one of Australia’s leading AIDS activists at the time, composer Lyle Chan. 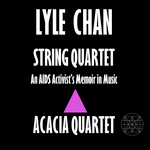 String Quartet: An AIDS Activist’s Memoir was sketched in the crisis years 1991-1996 by one of Australia’s leading AIDS activists at the time, composer Lyle Chan, but only completed some 20 years later and will now premiere in three cities. The 90-minute work is a tour-de-force of emotionally powerful music, sometimes agitated, sometimes tender, but always beautiful. It contains reflections of historic events, portraits of famous activist friends now dead, and unusual effects like the use of police whistles to recall street demonstrations by ACT UP, the direct action protest group of which Lyle Chan was a core member. In the crisis years, he and fellow activists couriered AIDS treatments from the US that were unavailable here, fiercely lobbied federal government to approve experimental treatments more quickly, and collaborated with drug companies to design clinical trials of promising new treatments.